Circular Economy graphic courtesy of www.EssentialEnergyEveryday.com. Since then other batteries and battery chemistries have come and gone and newer chemistries are advancing to get to the same level of sustainability as lead batteries. But today, lead batteries still serve as the most sustainable back-up power source we use. You'll find them in cars, boats, power stations, data centers, cell phone towers, children's toys, emergency lighting and a myriad of other uses. 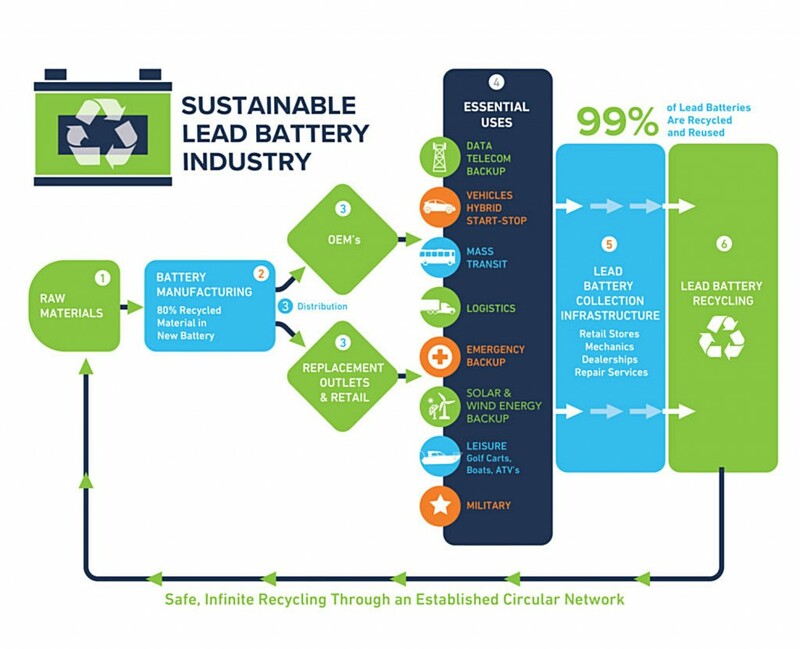 In an on-line brochure entitled "The Facts About Lead, the Energy Solution" produced by the BCI, "Innovative recycling facilities have been developed to recycle virtually 100 percent of a lead-acid battery's components. Collection, transportation, and handling of spent lead-acid batteries are well defined and regulated by the US government and by most states." The same thing cannot be said about lithium batteries. Most of the world's Cobalt is mined out of the Democratic Republic of the Congo in Central Africa (DRC). In an 87-page report published by Amnesty International and African Resources Watch (Afrewatch) in 2016, they discovered children as young as 7 years old were working in cobalt mines. It is no secret that children mine cobalt in the DRC. The US Department of Labor has listed it as a "good produced by child labor since at least 2009." Presentations at the annual Battery Show in Novi, Michigan, Sept. 10-12 emphasized that makers of lead batteries continue to refine the performance and design of their products. Lead batteries will continue to be an important part of newer, electronic vehicle operating systems. They will still be used to start the vehicle and they allow for regenerative braking, the process that gives these vehicles the ability to save their own energy to power the vehicle when idling or driving at low speeds. As for the continued rhetoric about emissions related to lead battery recycling, an article published Aug. 14 by TBS Engineering Group, a world leader in battery automation, explains what the lead battery industry is doing to improve the environment. "By 2020, it is predicted that start-stop technology utilizing lead batteries will help eliminate 2 million tons of vehicle greenhouse gas emissions annually in the U.S. alone. This is equivalent to the annual energy use of 211,000 average U.S. households." The ever-growing number of electric and hybrid vehicles being manufactured use an SLI (Starting, Lighting, Ignition) battery to start the car. "By 2035 there will be over 2 billion cars on the world's roads - the majority of which will include a lead battery," according to TBS Engineering.